Crisp and clean, with a subtle hint of licorice, raw fennel tastes amazing. Here I’ve shaved it paper thin on a mandoline slicer and tossed it with a simple dressing that perfectly complimented its fragrant qualities. The wispy and soft fronds—which are completely edible—were added in at the end to add a nice textural element to the dish as well as give it an elegant and pretty feel. Cut off the base of the fennel bulb. (Reserve the stems for making tea later.) Remove the stems and set aside. If it is a really large bulb, slice it in half. Carefully shave it on the mandoline blade, and set aside. Remove the fronds from the thick stems and place into a small bowl. In another small bowl, whisk together the oil, vinegar, mustard, salt and pepper. 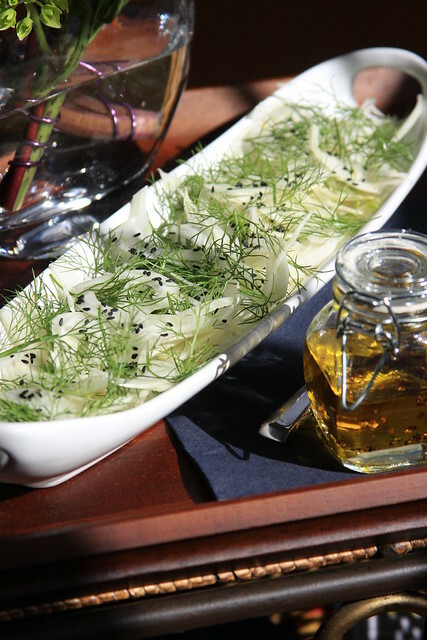 Dress the shaved fennel as desired, and sprinkle with the fronds and seeds. Serve immediately. Erin, what a beautiful picture! I love fennel in any variation. that is such a lovely salad. i love fennel, but very rarely eat it raw. i need to make more of effort to do so. i am a late lover of fennel but now when it is in season, i always always always grab it when i shop. i like it best this way: simply dressed.